Find and compare the best prices from a range of well known car rental companies at Athens Airport. This is a free to use facility, enabeling you to book direct with the company quoting the price. Athens Airport is effectively brand new, having been opened in 2001. There is one main terminal building (with halls A and B) plus a satellite terminal accessed from the main building via an underground walkway. The rail station is located 200m from the terminal building, accessed via a covered walkway, with both metro and suburban trains. 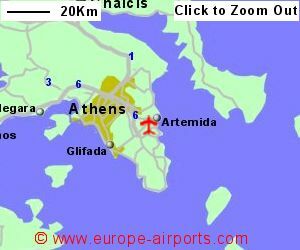 There are bus, metro, and suburban rail connections between Athens airport, Athens, and the surrounding area. A taxi to Athens is likely to cost 40 Euros during the day. The airport has 16 Restaurants/bars, over 40 shops, 7 lounges for business and first class passengers, currency exchange, banking and post office facilities, a fully equiped business centre, a childrens area, 22 Internet access points and FREE WiFi Interents access (for 45 minutes). The 332 room Sofitel Athens Airport Hotel is located approximately 100m from the terminal building and also has conference facilities. 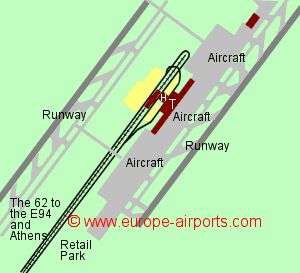 Since 2003, Athens airport has won a number of awards, including "Best European Airport". 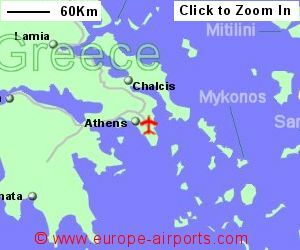 Athens airport has Airport Carbon Accreditation, at the Neutrality level. 21.7 million passengers were handled by Athens airport in 2017, an increase of 8% compared to the previous year.